Media and Contents: 8.5” x 11” soft cover with 36 pages of black and white photos and colour art-work plus two colour photos on the back cover. Advantages: Great pictures; impressive line drawings; attractive decals included. 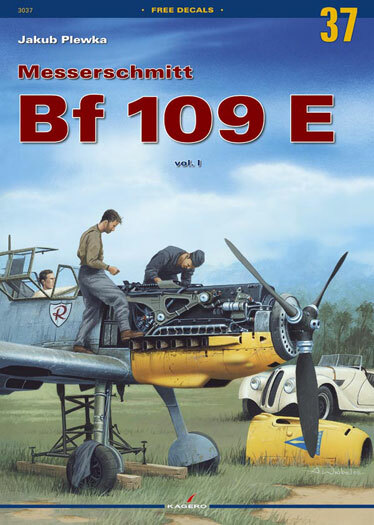 The Messerschmitt Bf 109 was the most prolific fighter aircraft ever produced. This softbound book from Kagero focuses on the Emil version. Built before the outbreak of hostilities, the Emil was the 109 that took the Luftwaffe through the first years of the war. The book is similar to their other offerings, however, there is no Polish in it with the exception of the captions for the color profiles. The photos are very large and extremely clear. The detail will be invaluable to the modeler. Some photos are a full page. All versions of the Emil, including the Swiss ones, are discussed. The photos are just one aspect of this book, there are four view line drawings depicting ever version, as well as, color profiles of approximately a dozen aircraft. Since the Emil went through an adaptive period of camouflage some very colorful machines are shown in the profiles. Kagero is well known for great pictures and the impressive line drawings but what they have been doing with this series is the surprise inside, sort of like Cracker Jacks except different. In this particular volume you are treated to decals with markings for five aircraft, including Rolf Pringle’s E-4. The decals are in the three major scales, 1/72nd, 1/48th and 1/32nd. There is a section on the Emil’s construction, the adaptive camouflage and finally one section on the employment of the 109 in combat. The text is very well written and easy to read. Sometimes in foreign publications there are some issues with the translation but not in this volume. You’ll be able to read this in one sitting. Large clear pictures, excellent line drawings and colorful profiles all equal a great investment. Thanks to Aeroplane Books for the review copy. To obtain your copy contact them at https://www.aeroplanebooks.com/. Let them know you heard about it here and check out the other great books on the site, including many out of print volumes.